With five days left until the release of his Suffering From Success album, DJ Khaled continues to flood the internet with cuts off the LP. 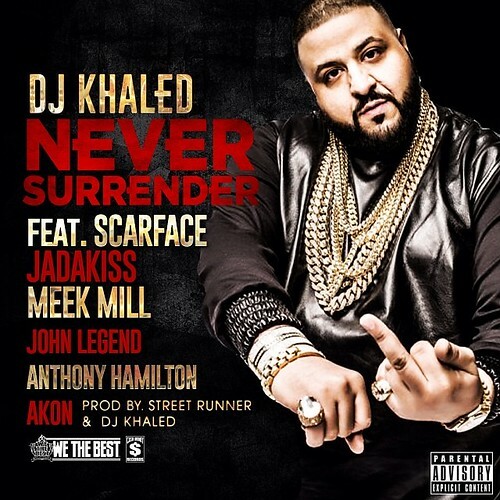 After giving us the Lil’ Wayne-assisted “No Motive,” the DJ-producer-mogul gets another star-studded cast on “Never Surrender.” Produced by Streetrunner and DJ Khaled, the uplifting cut features Akon, Anthony Hamilton, Jadakiss, John Legend, Meek Mill, and Scarface. A video was filmed earlier this month, which should arrive in the coming days. Pre-order Suffering From Success on iTunes. Listen to “Never Surrender” below….